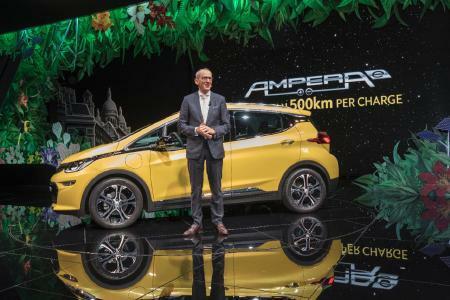 Opel CEO, Dr. Karl-Thomas Neumann today revealed the revolutionary Opel Ampera-e at the Paris Motor Show. The exhibition star offers a range of more than 500 kilometers (electric range, measured in the New European Driving Cycle in km: > 500 km, provisional figure) NEDC, at least 100 km more than its nearest segment rival currently on the road. The Opel stand is as green as the urban jungle and thus supports the main theme, sustainable mobility. During the press conference, Dr. Neumann also revealed that, as proof of the range, an Ampera-e drove the distance from London to Paris – 417 kilometers on the road – on a single battery-charge last weekend. And the batteries were still not empty when it arrived at the venue of the “Mondial de l’Automobile“. The on-board computer showed a remaining range of 80 kilometers thus demonstrating that the Ampera-e can achieve a range of around 500 kilometers under everyday traffic conditions. To complete its collection of range measurements and in addition to this real world London to Paris drive and the NEDC tests, Opel also tested the Ampera-e approximated to the speed profile defined in the stringent WLTP (Worldwide Harmonized Light-Duty Vehicles Test Procedure) driving cycle (shortened test procedure). And the vehicle also delivers here: Based on this development test, the engineers estimate the combined WLTP range to be more than 380 kilometers. Naturally, the range in everyday use will vary and depends on personal driving behavior and on external factors. In addition to its superior propulsion system, the Ampera-e also features a clever total concept: The efficient packaging of the battery under the vehicle floor enables a roomy interior providing comfortable seating for five passengers and trunk space comparable with that of a five-door car in the compact class. 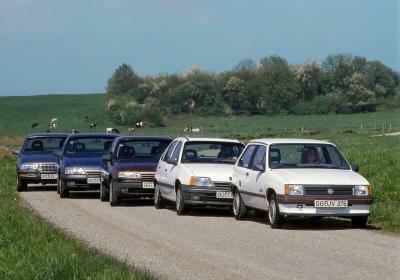 The additional stars from Rüsselsheim at this year’s Paris Motor Show are the new Opel Zafira, Opel MOKKA X and Opel KARL ROCKS. The lounge on wheels doesn’t only count on the tried and true qualities of its predecessor such as the Flex7® seating system, the AGR-certified ergonomic front seats (Aktion Gesunder Rücken e.V. – Campaign for Healthier Backs), the FlexFix® bicycle carrier and the adaptive FlexRide chassis. The new Zafira also features a new, bold exterior design and a re-designed interior with an especially spacious ambience and superb connectivity. For the first time in this vehicle class, Opel offers the latest-generation Adaptive Forward Lighting AFL with LED technology as an option. The compact SUV is wider and has a more solid and masculine stance than its successful predecessor – it has everything it takes to become an absolute customer favorite. The sporty, robust SUV turns heads with its newly designed front while its interior impresses with its functional and neatly arranged instrument panel. It looks both simpler and purer, as well as sharper and more precise in its execution. 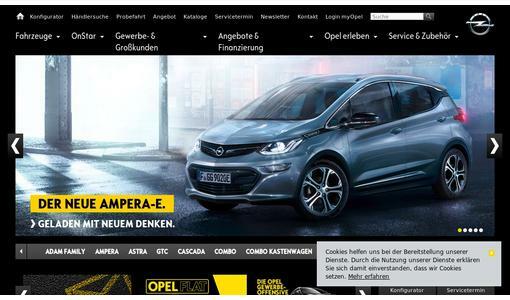 MOKKA X drivers can choose between various state-of-the-art versions of the new generation of the IntelliLink infotainment system; in addition there is top connectivity with Opel OnStar (standard from Edition). Another one of the MOKKA X’s highlights is its superb optional adaptive 4x4 drive system with electronic, multi-disk clutch. Opel’s new wild child features many characteristics of a true SUV and shares many virtues connected with this vehicle class such as an elevated seating position that enables better visibility, easier access to the cabin and an outstanding connectivity offer. Its rugged exterior features silver roof rails, robust front and rear bumpers with integrated skid plates, black front and rear wheelhouse moldings and unique 15-inch bi-color look alloy wheels.